I realize this just looks like a spinach salad, but there’s a lot more going on in there. For one, it was intended as a quinoa and spinach salad, and I did use the entire suggested amount of quinoa, but I had a lovely bunch of spinach and wanted to use every bit of it rather than only a couple of handfuls. So, the extra spinach is hiding a lot of the red quinoa. But, that’s not all. There are also chewy pieces of dried apricots, toasted pecans and pumpkin seeds, and a tangy dressing with pomegranate molasses and lemon juice. And, the grilled halloumi is seasoned with ras-el-hanout. 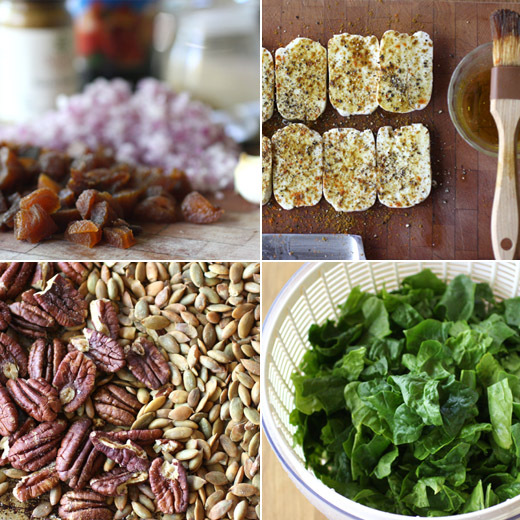 All those lovely flavors combined to make much more than some simple, spinach salad. I found this dish in the book New Vegetarian Kitchen which was an impulse buy a few weeks back. I was standing in the coffee bar line at Whole Foods when I saw the bright green cover of this book on a display and naturally grabbed a copy to peruse while my cappuccino was being made. In it, there are things like Watermelon Curry on Black Lentil Cakes, Bhel Puri on Poppadom Crisps, Spring Vegetables with Crunchy Walnut Crumble and Harissa Mayonnaise, Vietnamese Tofu and Mango Salad Cups, and many other things I want to try. The variety of dishes including sweet, savory, starter, and main convinced me I needed to take this book home. The first step of making this salad is to cook three-quarters of a cup of red quinoa. Do you rinse your quinoa before cooking it? I never used to rinse quinoa or rice but I’ve started doing so lately. Quinoa has naturally-occurring saponins on the surface that could affect the taste if not rinsed away. Odds are that it was rinsed before being packaged, but I give it another rinse in a sieve just to be sure. So, rinsed quinoa was cooked, drained, and allowed to cool. Next, halloumi was sliced, brushed with olive oil, dusted with ras-el-hanout and grilled on each side on a grill pan. At the same time, pecans were toasted in the oven, and pumpkin seeds were added to the baking sheet for the last few minutes. I made a little extra dressing since I was also using extra spinach, and that included about four tablespoons of pomegranate molasses, two tablespoons of lemon juice, four tablespoons of olive oil, one crushed clove of garlic, a pinch of ground cumin, and some freshly ground black pepper. To build the salad, the cooled quinoa was placed in large bowl and topped with the dressing. Cleaned and chopped fresh spinach was added followed by some chopped dried apricots, minced red onion, and chopped parsley. 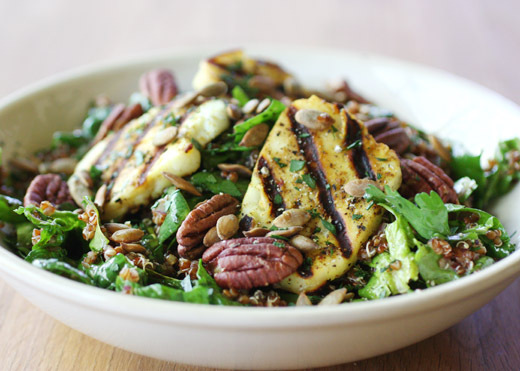 Each serving of salad was topped with a few pieces of grilled halloumi and some pecans and pumpkin seeds. I’m easily drawn to any dish with halloumi. I love the salty flavor it adds and the firm texture that takes so well to grilling or searing. The spices that mixed with the dressing, sweet dried apricots, nuts, and parsley were an added bonus. This tasty meal-of-a-salad indicates that my impulse buy was a good one. What an interesting salad!! Looks delicious! What a unique and filling salad. Much better than what I usually make. Thank you so much for sharing. Wish I could have this for lunch! The salad looks wholesome! I need to get some halloumi! It sounds so healthy and pictures are tempting. I like halloumi and pecans and everything inside. I Maybe I'd add quinoa as I have a small obsession lately. There is a lot of goodness going on in this salad Lisa. This is quite a departure from the usual way most of us have eaten halloumi. Love that natural saltiness of the cheese. Grain pairing with buttery pecans. I've seen that book and wondered about it. Pleased to hear it's a good one. Fabulous salad, Lisa. And perfectly presented. 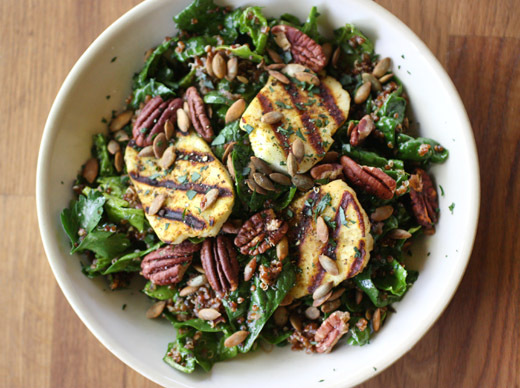 Huge fan of pomegranate molasses, and everything else in this salad sounds great to me! Lisa, once again I'm so drawn to your flavor combinations. Spinach, pomegranate molasses,quinoa, pecans, + dried apricots all wonderful! This is just the sort of one bowl meal that makes me happy - and healthy. What a beautiful salad. I love that it has quinoa in it. I've only recently discovered quinoa and I'm trying to use more of it in my meals. So yummy and so healthy. I didn't know to rinse quinoa either. Will do so henceforth. While this salad looks and sounds terrific, I'm really hoping that you make that watermelon curry. Very intriguing! Besides: I love Halloumi, thank you Lisa! At first glance this kind of salad looks simple but I know from experience how long they can take to make. This looks delightful. What an amazing salad. Love the addition of apricot in the salad as the sweet and salty combination is fantastic. Gorgeous salad! Love red quinoa and halloumi. I like how you flavor this salad with spices, nuts, herbs - glorious! I don't have that book - why don't I have that book? Great grill marks on the haloumi! Some of my very favorite things are in that salad - looks terrific!